exuding drops of blood ... consolation beyond all agony! Today's is for Mary, Our Sorrowful Mother. I started marking this special day on the liturgical calendar when I lost my son Raphael in stillbirth. Our church has a little shrine to the Sorrowful Mother and every year I put a little plant or flower on the shrine and pray. I found a very nice little golden mum to take this year and a similar one for my table. I frequently will take part of a bouquet that I leave on Raphael's grave and keep it on a vase on my table as a way of connecting us. I like that I was able to do that this year on the commemoration of our Sorrowful Mother as well. I also splurged a while back on e-Bay and bought a nice miniature replica of the Pieta. It sits on my table today with my mums. Last night Sam put it on the table with a rugged old cross for the Exaltation of the Cross. 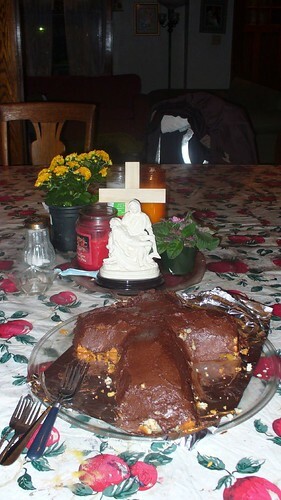 Our cross cake last night was interesting! The cake stuck to the cake pan and it came out sort of crumbling and was hard to frost. But I told the kids that Christ's cross was coarse and rugged, so it seemed appropriate not to have a picture perfect cross cake! We also read this charming book, The Tale of Three Trees: A Traditional Folktale It is a wonderful picture book that really focused on the meaning of holy cross. 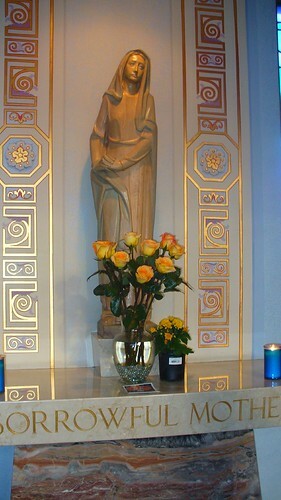 This morning I sat for mass in front of the shrine of Mary the Sorrowful Mother. My aching back perhaps made even more mindful of Mary's sorrow and Jesus's pain. The grief over my own lost child is more sublime and subtle nowadays, but I still frequently miss the little four-year-old boy who should be at my side and playing with his baby sister. I focused more this year on the grief of Frankie's mom for the loss of her little daughter. This prayer has much special meaning for me. Mary, my mother, obtain for me, I beg you, the grace of a holy resignation. Obtain for me the grace to understand this trial which is so hard for me to bear. I know that God in his all-wise providence has seen that it is for the best. Yet it is hard for me to bear the grief I feel. I come too you,dear mother, comforter of the afflicted and constant aid of those who trust in you. I know that you can obtain for me the peace and resignation that I seek. I confide in you entirely in this my tribulation and sorrow. You know the meaning of a mother's love, and can understand the dept of my affliction. Be to me a tender and protecting mother. For now, dear Mother Mary, I feel more than ever the need of your motherly love and sweet consolation. Mary sorrowing, Mary of all Christians, pray for us! because her children are no more." Elena, may our Blessed and Sorrowful Mother comfort you and other mothers who have lost a beloved child.